A magazine published in the context of the exhibition Tools for the Design Revolution. The exhibition by the IDRV — Institute of Design Research Vienna, shows design at a turning point. Design plays a key role in the remoulding of society to be capable of dealing with the future, as well as in the formulation of sustainable lifestyles based on global solidarity: tools for the design revolution are sustainable design strategies that can make a socially, environmentally and ethically sustainable future reality. Learning from each other, experimental strategies and concepts in connection with scientifically based methods are in the foreground. 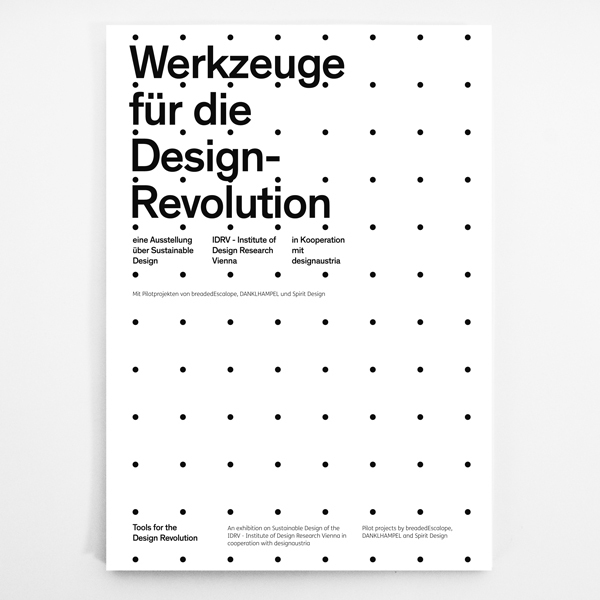 An exhibition by the IDRV – Institute of Design Research Vienna in cooperation with designaustria. Pilot projects by danklhampel, breadedEscalope, and Spirit Design.